Ebola's got nothing on our newest U.S. epidemic threat: measles. The maddening part of it for epidemiologists like me is that the rampant spread of this contagious, sometimes severe disease is entirely preventable. Ebola was never a grave concern to the medical community in the United States because of the remote likelihood that it would spread here as it has in parts of Africa. But measles, a disease we thought we had eliminated from the U.S., is now a top public-health priority. 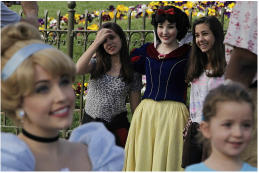 It has been widely reported that the current outbreak started in Disneyland and has now spread to six other states. So far, over 100 people have contracted the disease with more cases sure to follow as thousands more have been exposed. Measles has come back with a vengeance and, because of misguided concerns about the safety of vaccines, we may not be able to stop it. Measles is caused by the measles virus, one of the most transmittable pathogens we know. A person with measles, by coughing or sneezing, can infect up to 18 other people. (Contrast that with someone with Ebola who infects, on average, only two other people.) A person incubating measles can transmit it to others up to four days before they become sick themselves. The virus can last in the environment for a long time and you don't have to come into direct contact with an infected person to become infected yourself. Just being in the room where someone with measles has been 30 minutes earlier can expose you. Measles is not a benign disease. Back in the 1990's (yes, 1990's, not 1890's), three out of 100 children infected died from the virus and three out of 10 survived with serious complications. We still do not have treatment -- but we can prevent disease by using a safe, highly effective vaccine. In fact, the vaccine is so effective at preventing measles that the virus was declared eliminated from the United States in 2000! The only cases we saw were in people who contracted the virus while visiting other countries. So why is measles back in the news? In some places, immunization rates have dropped below the level needed to protect the community. Not everyone can be protected through immunization -- children under age 15 months and those with certain medical conditions can't be vaccinated and need to be protected by vaccinating other people so the virus can't circulate in the community. Why would parents chose not to protect their children and their community from this serious disease? In 1998, a study that's since been thoroughly and soundly discredited was reported in England, claiming to show an association between immunization and "leaky gut" in 12 children. These results have never been repeated and there have been numerous studies showing the measles vaccine is safe and effective. Unfortunately, some parents still have concerns and do not immunize their children. In parts of California, up to a quarter of children are not immunized, making outbreaks of measles and other vaccine-preventable diseases inevitable. While other states have not seen rates as high as California, the number of unprotected children has been increasing each year. In many states, immunizations are required before children can attend daycare, preschool, or kindergarten. But it is easy for parents to refuse. To get a medical exemption, parents need to get a doctor's note. But to get exempted for a "reason of conscience," all a parent has to do is submit a one-page form listing their child's name and birth date and the immunizations from which they want to be exempt. Immunizations are one of the Top 10 Public-Health Achievements of the 20th Century, and because of them, we've been very successful in controlling many infectious diseases that at one point contributed to the death of one in four children under age 5. The effect of this increase in unvaccinated children, as we've seen with the Disneyland outbreak, is that diseases that we thought were conquered will be reappearing. The decision by some parents not to immunize affects more than just their own kids. Children who are not old enough to be vaccinated or others who cannot be vaccinated for medical reasons are at risk of disease through no fault of their own. There's also the economic cost to society for trying to investigate, track, and control the outbreak, as well as the continued cost of treating what should have been prevented to begin with. We need better education on the benefits of immunization, including valid scientific data. We need deliberations on the consequences of not protecting children, and discussions about the costs to society of these preventable epidemics. This measles outbreak should be our wake-up call.